Every dead person can be reborn in any case (I heard that way of life is affected by the sin or karma of the former world. But we can be a rich or a poor depending on own effort.). Anyway, maybe you and me were friend in the former world. This idea is called En (Yen). 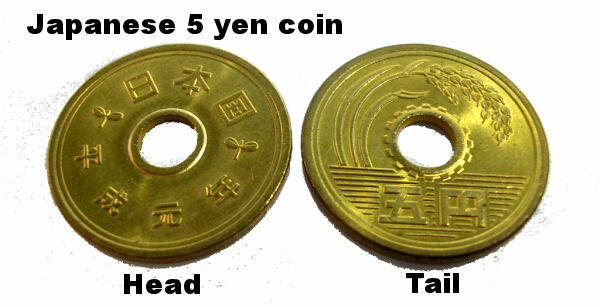 This coin is Japanese 5 yen. Pronunciation of ‘5 yen’ is ‘go en’ in Japanese. ‘go yen’ is a homophone with go-en, a word for karma, fate, relation and encounter. As a result, sometimes this coin is used as a token of meeting. Japanese have words, “Sode Fure Au mo Tasho no En”. Even if relationship of only touching clothes between each other, it was related to something each other in the former world. Meeting in this world is maybe the first and the last, so we have to make much of the meeting. You may meet your family and your partner at the next world. Your pet may become your friend as human being at the next world. Japanese people are delighted with non memory meeting at the former world, sharing suffering at this world, and they die as having wishes to meet at the next world. Of cource, the best thing is no rebirth as Buddhism ideas. The areas that staying the thought of the transmigration of the soul strongly are Tibet and Japan. By the way, Jodo school and Jodo Shinshu school are having different interpretation. In next content, I will write about that.